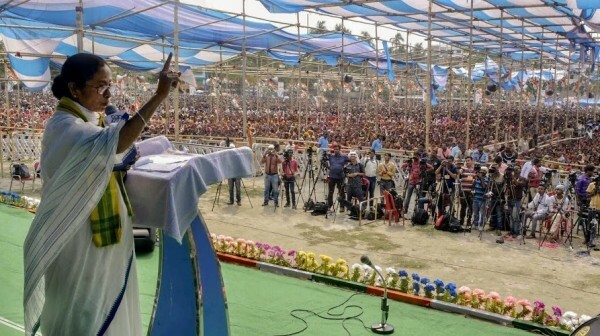 West Bengal Chief Minister Mamata Banerjee on Tuesday said her party Trinamool Congress will play the “most important role” in ousting the Narendra Modi regime from Delhi and forming a new government at the Centre in the 2019 polls. Arguing in favour of the opposition alliance, she said the anti-Bharatiya Janata Party (BJP) forces have joined hands in different states and have vowed not to leave an inch of space to the saffron outfit in the coming elections. “Trinamool Congress will play the most important role in forming the government in Delhi. It will play a significant role in ousting the BJP from the Centre. Only Trinamool Congress can do this fight,” Banerjee said at a public rally in North Dinajpur district’s Raigunj, a traditional Congress and Left bastion. “BJP is putting full force to politically misuse all the central institutions to win the elections. But we have also formed alliances in different states. Whoever is power in a particular state, is contesting (against BJP) there. We will not leave a single inch of space to BJP,” she said. Congress stalwart Priyaranjan Dasmunsi and his wife Deepa Dasmunsi won from the Raigunj constituency in three consecutive general elections before losing out to CPI-M’s Mohammed Salim in 2014. The Trinamool Congress has not been able to achieve a breakthrough in the seat so far. Referring to the fact, Banerjee urged the people at the rally not to “waste” their votes this time by giving it to the Congress or the Left as her party is looking to win all the 42 Lok Sabha seats in the state and emerge as a prime anti-BJP force in the country. “I know that either Congress or CPI-M wins in Raigunj. But tell me what work have they done here? Are they fighting against BJP’s misrule? No, Trinamool Congress is fighting them. BJP has not touched a single leader of either Congress or CPI-M,” Banerjee said. “Do not waste your vote by giving it to Congress or CPI-M this time. Do not vote for BJP either as they are destroying the country. Give your vote to us. We want 42 out of 42 seats in Bengal this time. It is needed because Bengal will play a major role in forming the new government at the Centre,” she noted. She also attacked Prime Minister Modi claiming that he was inducted to politics through violence and riots and accused him of only focusing on “self-publicity”. “Narendra Modi does not do anything else but self-publicity. He thinks himself to be a bigger leader than Gandhiji or Abdul Kalam. They were inducted to politics through riots. We have not forgotten how many people they have killed in Gujarat,” Banerjee said. Coming down heavily upon the saffron party leaders including Modi and Amit Shah for seeking votes from Bengal, Banerjee said they envy Bengal and deprive Bengal the most. “You did not even allow us to change the name of West Bengal to ‘Bangla’ in spite of its passage in the state Assembly twice. You people do not like Bengal. You are envious of Bengal,” she added.